It seems that it is you who will become a fighter with vampires otherwise no one will be able to fight these terrible creatures. The vampires in this addon are of 3 kinds and they are all very dangerous especially at night. During the day you can safely walk but keep a sharp sword with you. Now even the villages have turned into a haven of vampires, it's better not to go there. They very often will meet in the ordinary world and you immediately distinguish them from standard mobs. They have big fangs and red eyes, as well as a black suit. 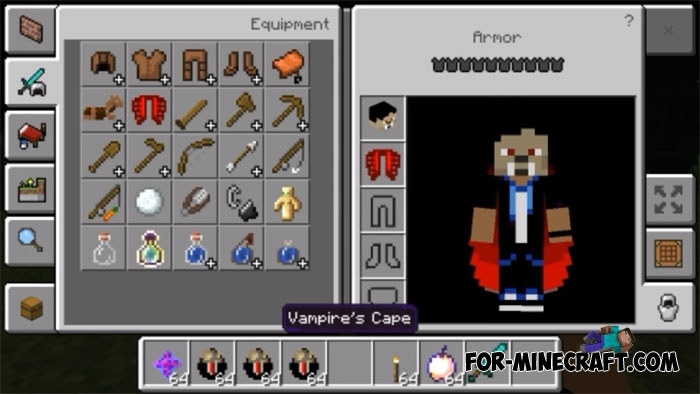 Winning a vampire gives you new items that you can use later on. Firstly, instead of wings you will get a red cape, which can be used as a stylish thing and an indispensable item for a smooth landing. Healing Star falls out of the updated boss, try to defeat him. In general, if you like blood and constant battles with bloodsuckers, then install the War Z mod for Minecraft PE and try to survive a few nights. How to install the Vampires addon?